A Frenchman said to be connected to the gunmen behind a deadly terrorist attack in Paris has been extradited from Bulgaria to France. Mr Joachin has admitted to being an associate of the attackers of Charlie Hebdo magazine but denies being aware of their plans. Mr Joachin, 29, arrived in France on Thursday and was due to be questioned later in the day, unnamed judicial sources told Agence France Presse news agency. 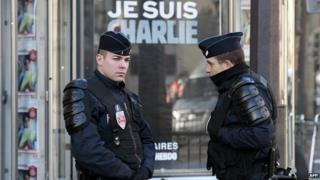 French police say he is associated with Said Kouachi and Cherif Kouachi. The two brothers stormed the offices of Charlie Hebdo on 7 January and opened fire using automatic weapons, killing 12 people. Two days later, a third gunman, Amedy Coulibaly, killed four Jewish people at a kosher supermarket. A policewoman was also shot dead. The Islamist gunmen had links to groups based in the Middle East, and said they were "avenging" cartoons of the Prophet Muhammad in Charlie Hebdo magazine. Mr Joachin was thought to have been on his way to Syria with his three-year-old son when he was detained, according Bulgaria's Sophia news agency. French authorities have arrested four other people for alleged links to the attackers.